and father John Wayne by his side. Virginia Hunt Newman assists Marisa Wayne. You might say Virginia Hunt Newman 'dove' her way into swim teaching. From 1940 to 1948 Virginia Hunt (Newman) was a competitive diver at the Los Angeles Athletic Club. She appeared in water shows for the WWII troops on behalf of the United Service Organization and the Hollywood Victory Committee. In the 1940's Virginia dove at a water show at Ambassador Hotel in Los Angeles where another emerging baby swim teacher - Crystal Scarborough - routinely taught. Virginia started teaching swimming in 1950. Around Los Angeles such instruction for babies could have included screaming and vomiting students. (Virginia remembers visiting a pool where the teacher had pan on deck at the water's edge for students to vomit into. Students shouldn't be vomiting!) Parents were usually not included in the water with infant-toddlers classes during the 1950's. "Students were taken into the water but really didn't seem to be doing very much in most cases" Virginia recalls. She visited the programs conducted by Scarborough and Scarborough's sister Jen Loven. From 1951 to 1956 Virginia taught swimming and diving at Black Fox - a boys military school. She also taught lessons in peoples' homes. Students included children of movie stars and entertainers Harry Cohen, Jerry Lewis, Alan Lad, Bob Newhart, and Max Factor at the school. Side note: When school headmaster Major Gaver interviewed Virginia for the position he said that (male) teachers who'd been at the school a long time couldn't see how a little woman could manage these boys. Virginia's response was - "Just sit back and watch!" She got the job, stayed five years and commanded the respect of the boys and fellow teachers alike. Virginia says it was one of the greatest teaching experiences of her career. 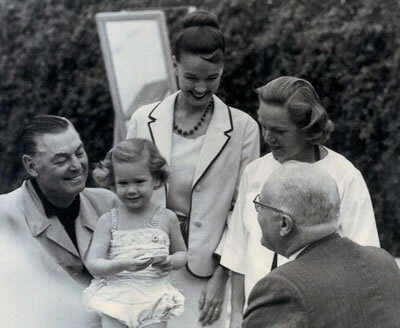 while Johnny Weissmuller, her mother Kathryn Crosby, and Virginia Hunt Newman look on. In the early 1960's Virginia got a referral to teach children in a special family. Virginia had been teaching obstetrician, Dr. Moss's children who also happen to be the doctor of Kathryn Crosby wife of singer and movie star Bing Crosby). "Kathryn called and asked if I would teach her children, Mary Frances and Harry, too," Virginia said "Sure". Since the Crosby home did not have a pool, she taught them at Dr. Moss's home. Virginia says both children were good students but Mary Frances was more outgoing and the 'perfect student'. At age 2 years she could back float, jump in and swim 25 feet recovering up to the surface to get air as she went. Virginia covered all the skills with the 2-year old that were then associated with the American Red Cross 'Beginner' test. Regarding the amount of instruction given Virginia states: "Mary Frances started swimming at age 10 months and she was almost 2 1/2 years old in February 1962. We swam 3 times a week for 1/2 hour excluding vacations. I don't recall either she or Harry staying home because of illness. So it took about 175 to 180 hours of time in the water including play time for Mary Frances to learn the skills she needed to pass the Red Cross beginner's test. Virginia contacted the Los Angeles area office of the Red Cross to secure a 'beginner' card for her student. Given Mary Frances's achievements for her age and her famous father, local Red Cross Director Roger Plaisted agreed to present the card himself at poolside at the Moss residence in February of 1962 - hence the photo! National magazines, newspapers and TV were present for the ceremony. Famous swimmer and actor Johnny Weismuller came along with Plaisted. Kathryn Crosby accompanied her daughter but Bing did not attend. 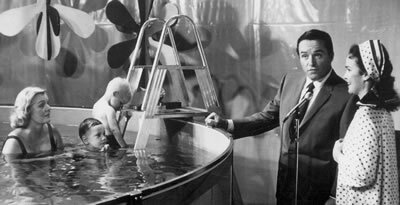 are in the pool all with host Mike Douglas on the Mike Douglas television show. Mary Frances demonstrated her swimming prior to receiving her card. Virginia recalls: "I didn't want to take her to a new and strange place for the demonstration even though she was quite outgoing so we held the ceremony at the Moss's home where the lessons had been all along. I didn't want to take any chances knowing the entire media would be there. I also didn't change my swim suit from the one I wore in the lessons and I asked her mother not to let Mary Frances wear a different one either. I treated it as though it were another lesson. Heavy, heavy hung over my head. And luckily it was very successful." 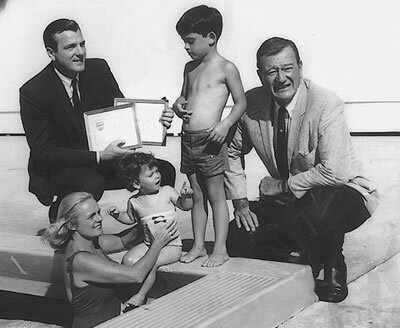 Virginia was also commissioned to teach children of actor John Wayne. Virginia also taught a daughter of author Harold Robbins - Adriana When they met Virginia a the door of their home on the first lesson day, Adriana said "I am not going to put my face in" to which Virginia responded "Well you don't have to do anything that you don't want to do." In working with Adriana, Virginia put her own face in and glance around the pool, came up and remarked to Adriana, "Do you know you have gold fish in your pool?" "No we don't" said Adriana over and over again. But shortly there after, Adrian put her face in and rose to remark, "We also have an octopus in our pool!" Admitting that she didn't know who Harold Robbins was, Virginia laughs when she recalls a conversation with Robbins' wife. "We talked about my book (published in 1967) and she said, 'You know, my husband is a writer too'. I said "Oh really what does he write?". "Novels", his wife said. Virginia also taught the daughter of Sonny & Cher - Chastity. According to Virginia there was little to teach Chastity since father - Sonny - had already done a good job of it. Virginia has been featured in the New York Times and interviewed by Barbara Walters on the NBC Today Show. She'd also made a trip to Philadelphia with Katherine Crosby to appear on the Mike Douglas TV Show. According to Virginia there was a chance meeting that would greatly shape her teaching style as recorded in her 1967 for the future. Here husband was a producer and was filming a commercial for a bank wherein a rabbit had been trained to pick up a silver dollar and place it into a small bank. Virginia was on the set when the commercial was being filmed and spoke with the person who'd trained the rabbit - a Dr. Shaw from the Univ. of Arkansas. He said that in training the rabbit every time the animal would go near the bank, a bell would ring he'd be given food - positive reinforcement. That rabbit changed the face of infant swimming as Virginia went on to make applications to her teaching. She thought she'd try that with a friend's baby and was granted permission. She knew also that babies like to please their parents. Every time child did what Virginia wanted, she'd give praise. Any action or response that was not desired would be largely ignored. In addition Virginia read about the work of scientists Pavlov and BF Skinner on positive reinforcement. Later she gave students poker chips as reinforcement - the chips were kid-size, brightly colored and water proof. As a Side note - for her 80th birthday Virginia was given actual red, white, and blue poker chips with her contact information imprinted - serving as 'business cards'. Virginia passed away in 2009. FOR THE RECORD: Swimming instructor of infants; Produced film on how to dive springboard. 1967--published Teaching An Infant To Swim; Best known for developing the non-forceful, non-traumatic method of teaching infants and young children to swim. Virginia Hunt competed in swimming for the Indianapolis Athletic Club from 1932 to 1940, winning numerous Midwest and national titles. From 1940 to 1948 she competed in diving for the Los Angeles Athletic Club where she won several Southern Pacific Association titles and a national title. During World War II, Virginia traveled with the United Service Organization and the Hollywood Victory Committee, appearing in water shows with Hall of Famers Johnny Weissmuller, Stubby Kruger, Buster Crabbe, and Dutch Smith, for the armed services. Although she was quite successful as a swimmer and diver, Virginia is renowned for her accomplishments as an infant swimming instructor. She began teaching swimming to infants and pre-schoolers in 1950 and became an aquatic director and diving coach at a private boys' school. During this time, Virginia wrote and directed a series of films on springboard diving and served as Secretary of the Southern Pacific Association Diving Committee for two years. In 1962 she came to a major turning point in her career. Her star student, two-year old Mary Crosby, daughter of entertainer Bing Crosby and his wife Kathryn successfully passed the skill test for the Red Cross Beginners Certificate. At this time, Mary was the youngest child in the history of the Red Cross to do this. So impressed with her achievements and the fact that she was the daughter of Bing Crosby, Mary's award was personally presented by the director of Red Cross Safety Services and Hall of Famer Johnny Weissmuller on national television and covered by Life, Look, and Time magazines and headlined in the Los Angeles newspapers. This event led to the compiling of Virginia's methods in her book Teaching An Infant to Swim in 1967. It gave world-wide attention to non-forceful or non-traumatic teaching methods. Her book became so popular that it was published in England, Australia, Germany, Sweden, Italy, and Japan. She later published her next book Teaching Young Children to Swim and Dive, in 1969. Besides her success with young Mary Crosby, Virginia was also the swimming instructor for the children of John Wayne, Bob Hope, Harry Cohen, Jerry Lewis, Alan Ladd, Bob Newhart, Max Factor, Sonny & Cher, and Danny DeVito and Rhea Perlman. Her methods, distraction from normal fears associated with learning to swim and rewards for trying and performing skills, have been accepted by thousands of swim instructors world-wide.